Hello dear readers, hope you are doing well. 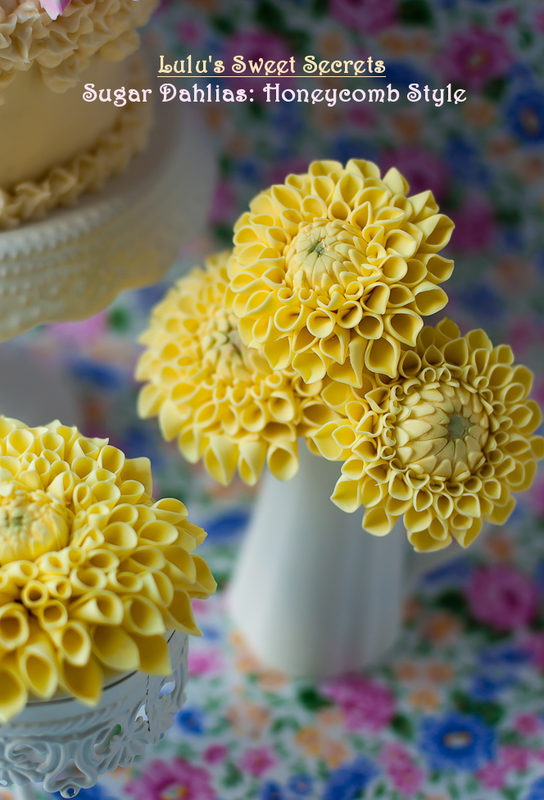 I’m very pleased with all your adorable comments on my last post about the yellow dahlia. I very much appreciate them. 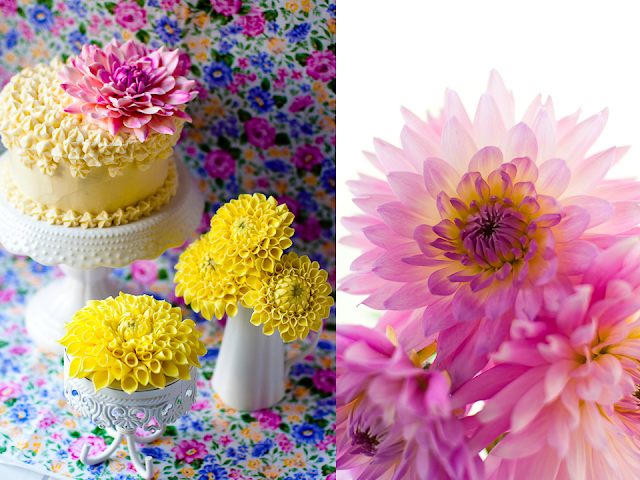 To thank you all I prepared some tips on how I made my sugar dahlias. I’m very excited to share my first tutorial and I hope you like it! I really love make these flowers and I’m pretty sure you will love too. It’s required a little bit of patience to modelling and assembly the petals, but in the end you will see that is a relaxing and pleasurable work. They are lovely embellishments for cakes and cupcakes at weddings and bridal showers. 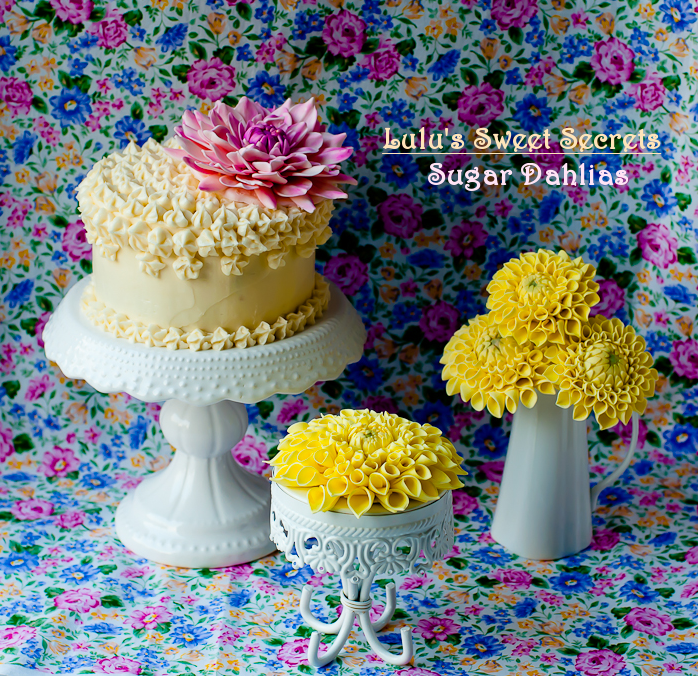 When I decide to reproduce a sugar flower I like to be familiar with the structure of the real flower, so I can create the perfect one. It is important to study each detail of the petals like the texture and shape. There are several species of dahlias and for this tutorial I chose the one with honeycomb style and the one with Chrysanthemums style. 1. 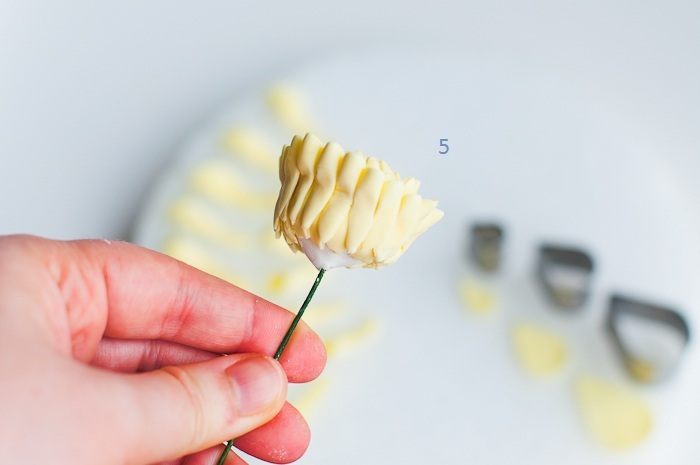 Roll a small ball of gum paste and with a piece of wire create the core of the dahlia. Leave to dry until hard. 2. 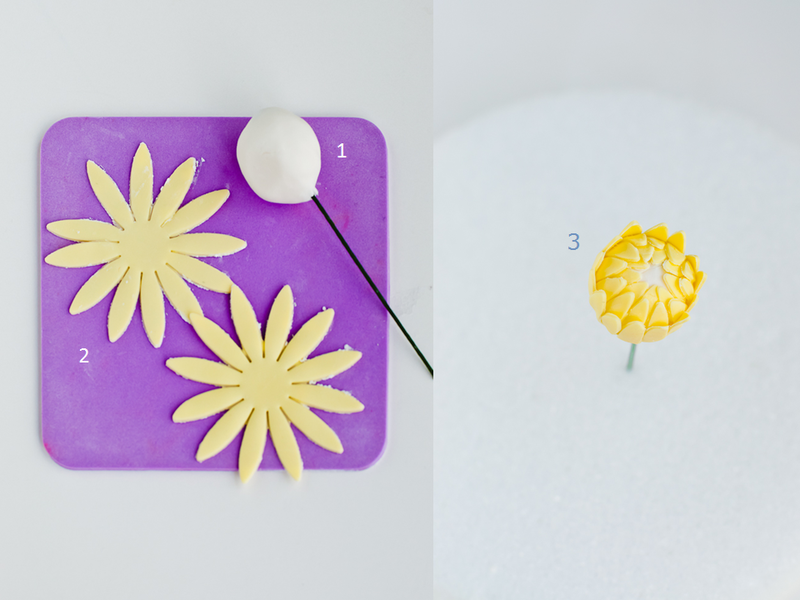 Roll out yellow gum paste and cut out 3 flowers using a small daisy cutter. 3. Brush edible glue over the core. Slide the flowers, one by one, through the wire all the way to the base of the core to form a tight bud. 4. Make the petals using different sizes of the tear drop cutters. 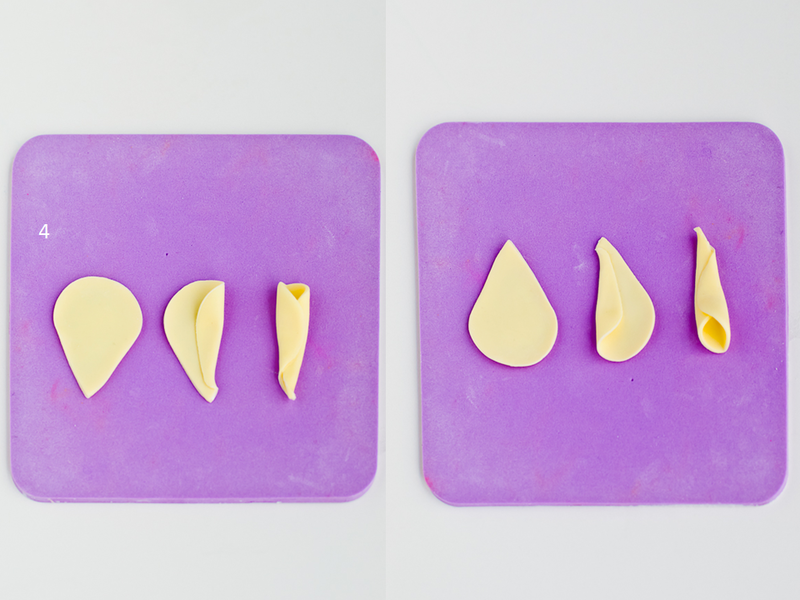 Place the flower on a cel pad and gently smooth each petal with a bone or ball tool to thin the edges. Put dots of glue in the lower edges and fold each side over so that they meet in the middle. 5. 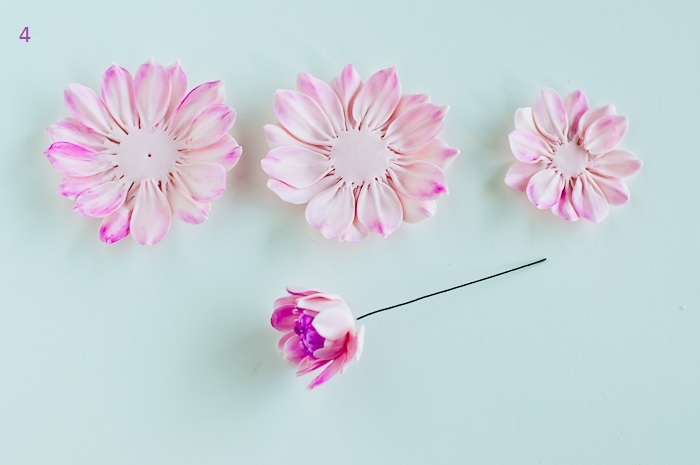 Brush edible glue around the bud back and add the smallest petals one by one. 6. Repeat with as much layers as desired. Increase the size of the cutters every 2-3 layers. 1. 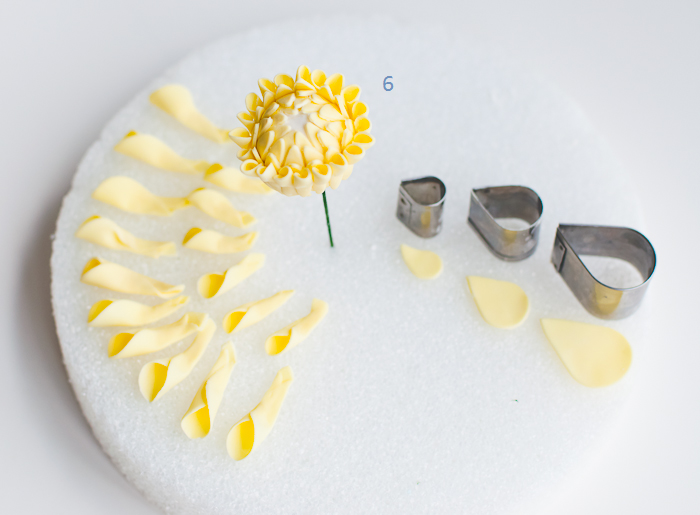 Roll a small ball of gum paste and with a piece of wire create the core of the dahlia. Leave to dry until hard. 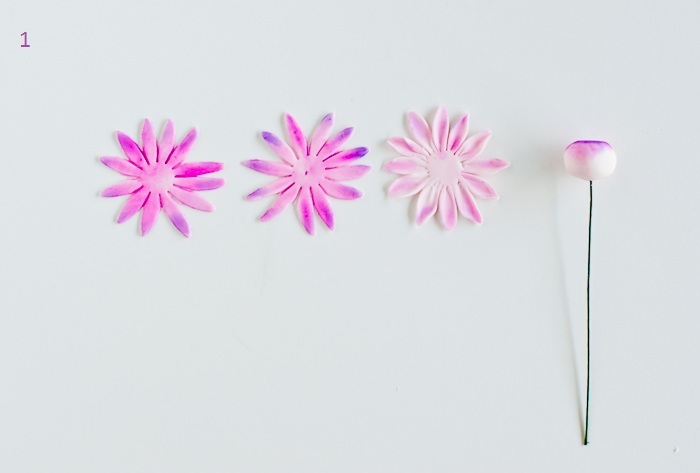 Roll out pink gum paste and cut out 3 flowers using a small daisy cutter. Color the flowers with magenta and violet petal dust. 2. 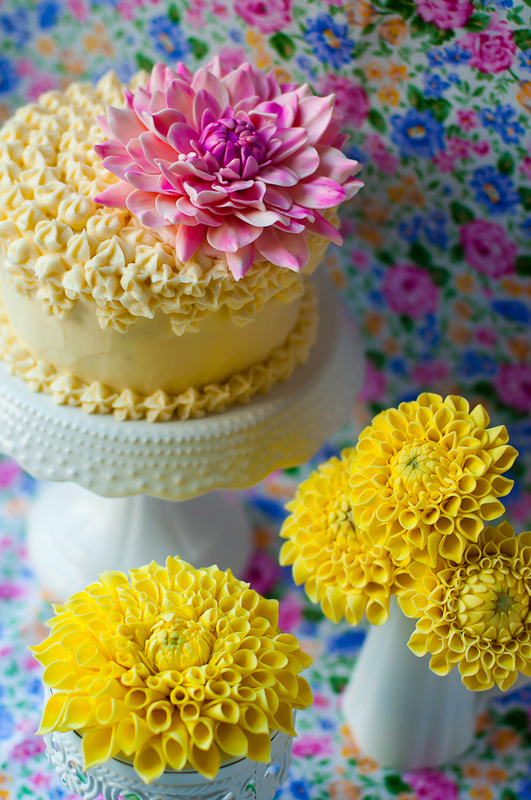 Roll out pink gum paste and cut out one medium daisy and two large daisy flowers. 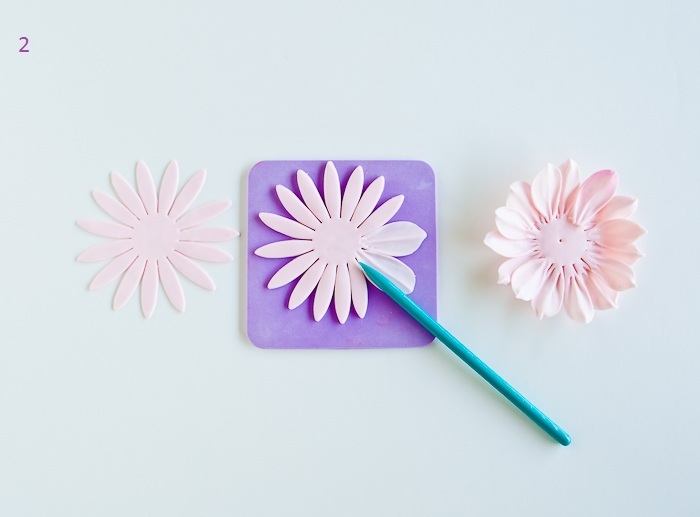 Place the flower on a cel pad and gently smooth each petal with a modeling stick to thin the edges and give the petal shape. 3. 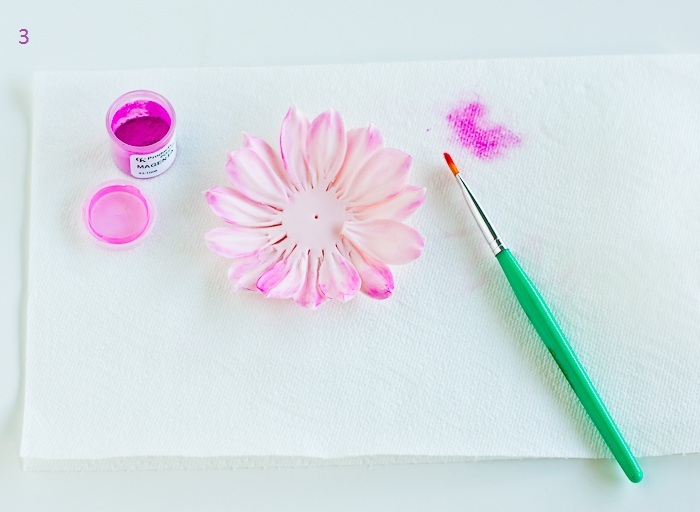 Color the flowers with magenta petal dust. 4. Brush edible glue over the core. Slide the smallest flower through the wire all the way to the base of the core. Brush glue and repeat with the second and third flowers to form a tight bud. Repeat the process with the medium and large flowers. Awesome, I will try this asap, beautiful for someone special. I'm speechless!!! Luciana, you are amazing. I cannot describe how gorgeous these are and great tutorial. I'm so impressed that I lost my words!! That cake is gorgeous. Its so nice to click on a recipe to find a full, illustrated tutorial on how to make whats in the picture. Thank you so much! 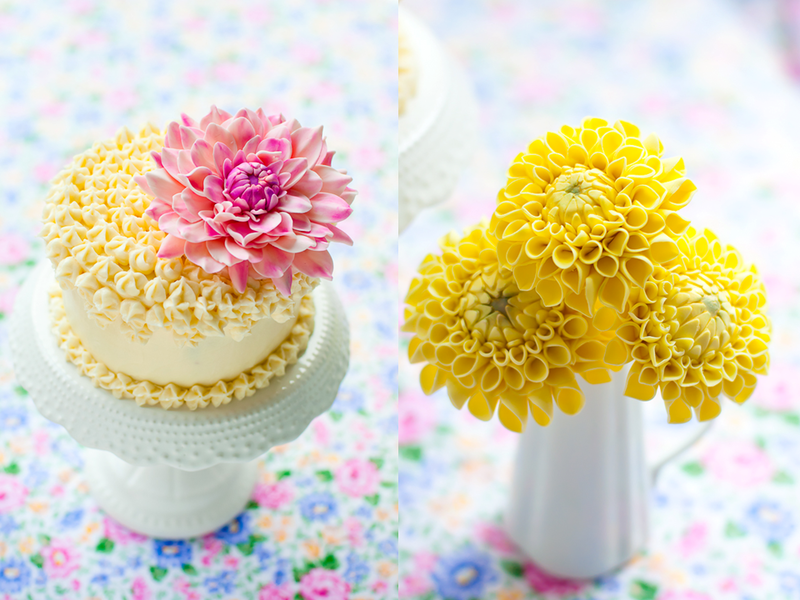 So cool, I will have to try soon, I love making sugar flowers! 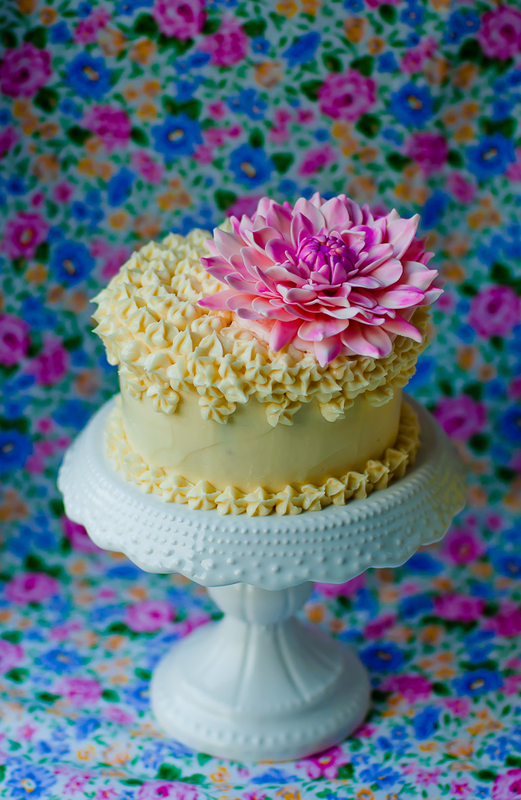 This is a great tutorial and a beautiful cake! I saw it on FoodGawker.com and wanted to compliment you on your site. This cake looks wonderful! And the sugar flowers? Stunning! Wow, these look amazing!!! Thank you for teaching us! Wow, Thank you! I will have to try it myself. Oh Luciana you've done it again! Your beautiful creations always take my breath away, and now you've made it look *almost* doable - what a great tutorial. Thanks! Incredible!!! Absolutely amazing. They look completely real. Wow. That is amazing! I love them. You are very talented! 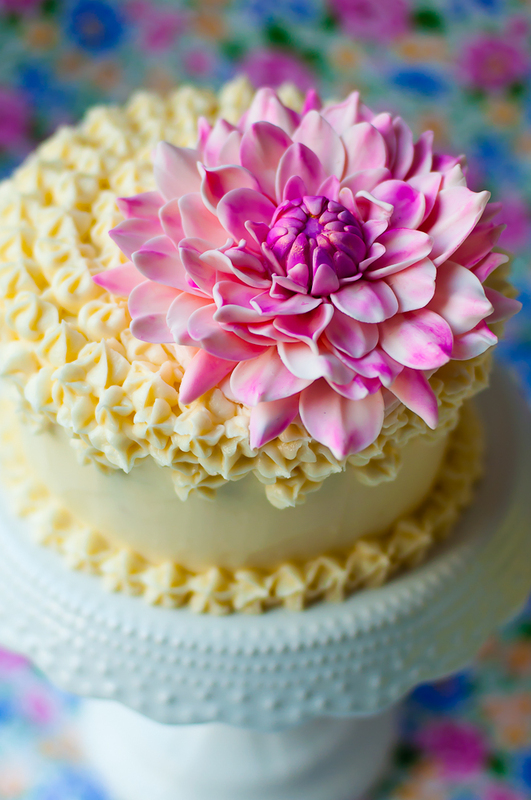 I've always been scared of decorating cakes, so I must say that what you do with your cakes is pure art! I have just come across your blog and trust me will be back. 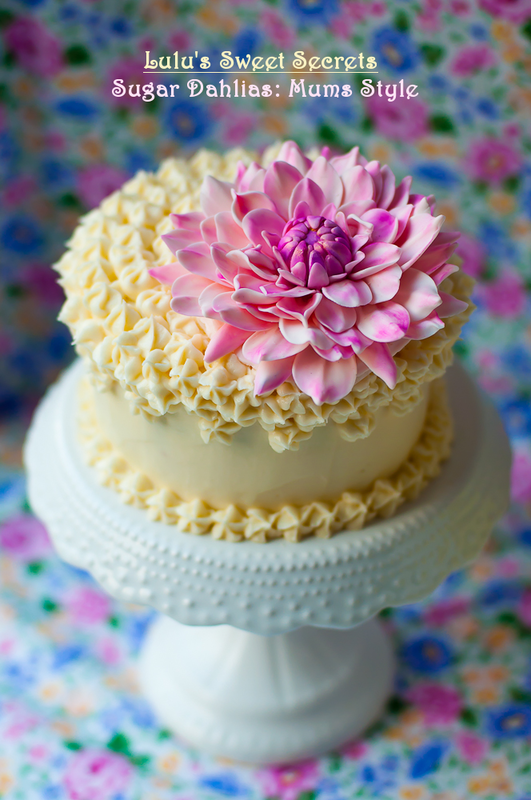 I love cake decorating but have been out of action for a while you have inspired me to start up again. Your tutorials are really good to follow. wow is all I can say!!!! gorgeous work!!! wonderful to find and follow your blog!!!! You are amazingly talented. At first glance, I thought these were real dahlias. Such beautiful work, and your photos are also so inspiring. That looks sooo flipping amazing! Which daisy cutter set did you use? Hi, the daisy ctter is from Wilton. THANK YOU SO MUCH!!! you are VERY GENEROUS!! GBU!!! Copyright © 2010 Luciana Borges. Simple theme. Powered by Blogger.